George Burchett was probably the most famous tattooist of his era, which spanned from 1890 through 1953. Burchett tattooed in London through two World Wars and Burchett catered to both the rich London society and the poor alike. Born George Burchett Davis on August 23, 1872 in Brighton England, George did his first "scratching" (as he described it) on his schoolmates. One of his first customers was his younger brother Charles, who at the age of four or five was wiling to pay the large fee of a stick of liquorices for the pleasure of being scratched by George. George Burchett joined the Royal Navy at the age of thirteen and found that his ability to scratch was welcome. 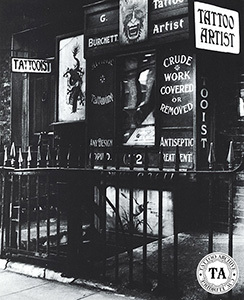 At this time Burchett got his first tattooing kit from an Able Seaman Weatherby. Enlisted seamen are often taken to exotic locations where they have a chance to get tattooed. For Burchett it was Yokohama Japan where he had the great pleasure of being tattooed by Hori Chiyo. Navy discipline proved too much for the young George, so he jumped ship in Jaffa and did not return to Great Britain for twelve years. In order to avoid the authorities George Burchett Davis dropped his last name and became George Burchett. During this part of his life, he worked as a tram ticket seller and a cobbler, but continued tattooing part time. 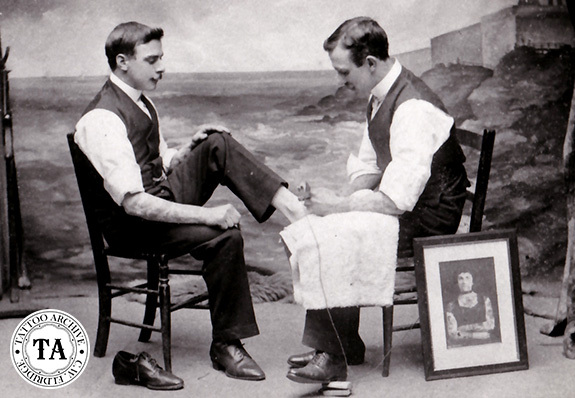 In 1900 he became a full time tattooist. During the next half century and until his death in 1953, George Burchett created one of the largest tattoo practices in the world. Charles Davis followed in his older brother's footsteps into the tattoo world, but never received the acclaim that George did. The brothers worked together at times and also operated shops separately for many years. George and Charles were just a few years apart in their ages. It's difficult to tell them apart in photographs today, with both of them dressed in white shirts, vests and ties, and sporting well-trimmed mustaches and matching shoes! They both even liked to work in white medical smocks. In later years Charles stepped away from tattooing, and in the 1950s George wrote that Charles was active in the insurance business. We would like to thank Lal Hardy for the audio clip featured with this article. For more information on George Burchett and his amazing tattoo career see Jon Reiter’s book, King of Tattooists, The Life and Work of George Burchett. Audio clip from an interview with George Burchett.